Transport and unload with ease with the Swisher<sup></sup> 16 cubic ft ATV Poly Dump Cart Trailer. It's great for hauling firewood, landscaping materials, fencing supplies or almost anything else you need to get from one place to another. Ruggedly designed to go where your ATV can go, it features extra-tough, high-density poly tub with tilt, large ATV tires, high speed sealed precision ball bearings, and a heavy duty 2" tubular steel frame. It quickly attaches to ATV and easily dumps your load. Extra long tow bar allows for sharper turning radius, while offering more space behind ATV rack for optional rack accessories. 750-lb. capacity. Made in the USA. Help keep your outdoor power equipment running buy replacing maintenance parts such as your exhaust muffler. This item is degisned to fit Briggs & Stratton, Tecumseh and Kohler cylinder type mufflers with 3/4 inch national pipe thread. Fix poor or non-running engines with 1 Gal. Mechanic In A Bottle. This synthetic fuel additive works in your power equipment with 2-cycle and 4-cycle engines. It removes all varnish in the fuel system without having to remove the carburetor, removes carbon deposits, removes water, reconditions rubber and plastic components, and revitalizes old fuel. Mechanic In A bottle rejuvenates your equipment's fuel system so that it starts efficiently and operates in top condition. Compatible with many snowmobile and personal watercraft engines. E3 Spark Plugs feature DiamondFire technology. A revolutionary new spark plug that provides more energy, greater efficiency, and is more eco-friendly. Designed to increase horsepower and lower emissions. Quicker starts, saves on fuel. Replaces Champion L78C, L82C. Replaces NGK B7HS, BR7HS, BR7HS10, B7HS10, B7HV, B8HS, B8HS10, B8HV, and manu others. Small engine spark plug can be used on many snowthrower and tractor engines. Consistent starts. Dependable performance. Superior fouling resistance. Replaces Champion N4C, RN4C, N7YC, RN7YC. Replaces NGK B4ES, B5ES, B6ES, B7ES, and many others. 16 cu. ft. Poly Dump Trailer with 750 lb. Capacity Transport and unload with ease with the Swisher<sup></sup> 16 cubic ft ATV Poly Dump Cart Trailer. It's great for hauling firewood, landscaping materials, fencing supplies or almost anything else you need to get from one place to another. 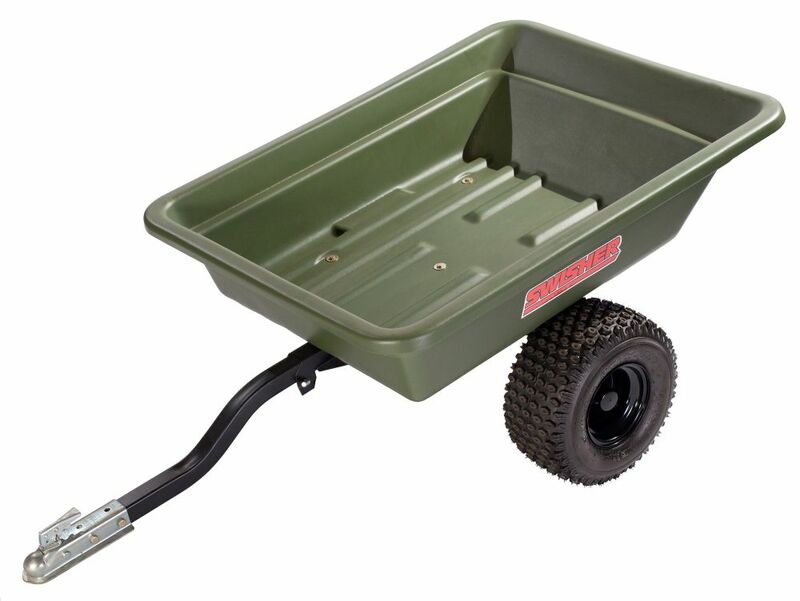 Ruggedly designed to go where your ATV can go, it features extra-tough, high-density poly tub with tilt, large ATV tires, high speed sealed precision ball bearings, and a heavy duty 2" tubular steel frame. It quickly attaches to ATV and easily dumps your load. Extra long tow bar allows for sharper turning radius, while offering more space behind ATV rack for optional rack accessories. 750-lb. capacity. Made in the USA. 16 cu. ft. Poly Dump Trailer with 750 lb. Capacity is rated 5.0 out of 5 by 1. Rated 5 out of 5 by Tactical from friggin awesome! its worth its weight in gold! tones of ground clearance & takes anything the trails dish out, if you own a lot of land & or camping this is it!